The Nottingham-based artist Wolfgang Buttress attracted huge media interest with The Hive, his bee-inspired sculptural installation for the 2015 Milan Expo UK pavilion. Wayne Burrows speaks to him about the work, currently on display at Kew Gardens, and BEAM, a companion piece on show at this year's Wirksworth Festival. 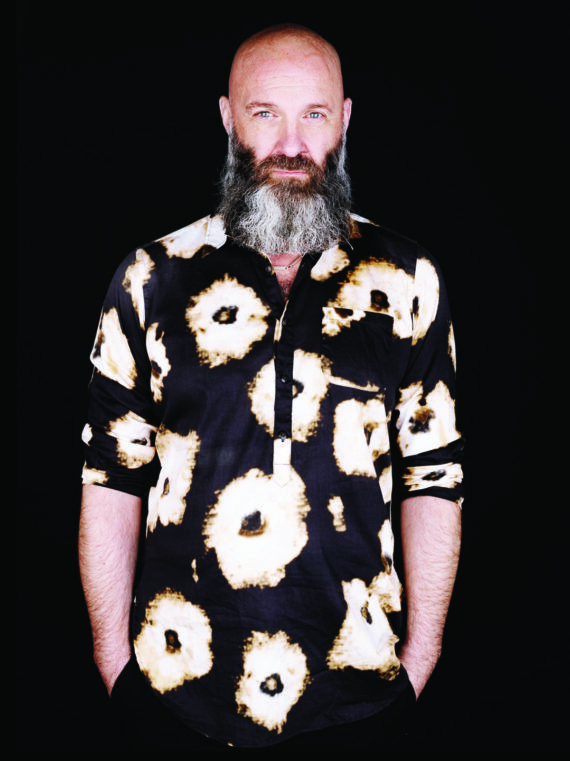 Wolfgang Buttress is an artist best known for his large-scale outdoor sculptures, often made in collaboration with scientists, which explore themes ranging from belief systems and the natural environment to astrophysics. In his multiple award-winning Milan Expo UK pavilion commission, The Hive (2015), he investigates the complex lives and ecological importance of bees. His work has been commissioned and installed in many public spaces around the UK and internationally, including Axel (2004) at Nottingham Ice Arena, Candle (2010) in Gloucester Docks, Rise (2011) in Belfast, and UNA (2013) in Canberra, Australia. Buttress was born in Cumbria, studied for his degree at Nottingham Trent University, and remains based in Nottingham. The Hive – which attracted over 3 million visitors in Milan – is currently in its second incarnation at Kew Gardens, where it remains until the end of 2017. A new installation, BEAM, a companion piece to The Hive, will be on show at St Mary’s Church, Wirksworth, Derbyshire as part of this year’s Wirksworth Festival. 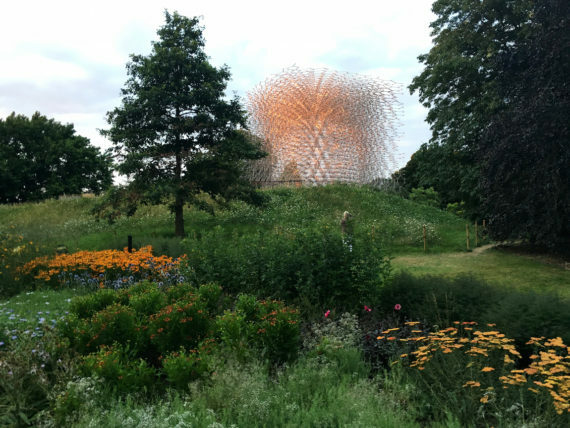 The Hive relocated to Kew Gardens earlier this year after its run at the Milan Expo in 2015, and has been winning a lot of attention and awards. It’s amazing how it’s all panned out. My big public projects generally take two years or more to complete but The Hive was condensed into 12 months. Luckily, the basic idea was strong and simple, with lots of layers, and in some ways having that shortened deadline turned out to be a good thing. It made us focus on what was important and allowed us to plough through a lot of the bureaucracy that usually comes with these kinds of projects in a way that isn’t always possible. 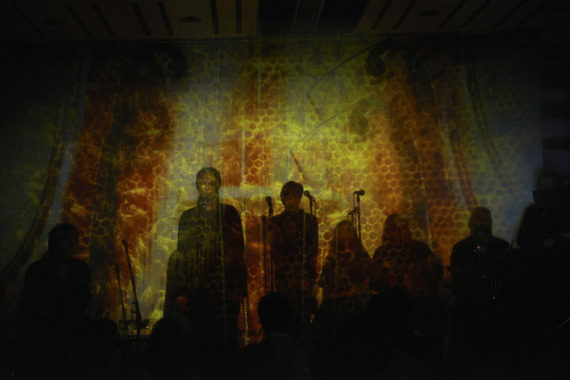 The Hive has also generated a musical project, BE: ONE. 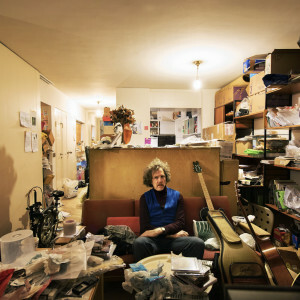 I was always keen to have some connection between the human and the bee elements set up within the structure, and it was during the research process, while working with Dr Martin Bencsik – a physicist with an interest in the vibrations produced by bees – that I realised there was the potential to do something with music. We could hear what was happening inside the beehive at Brackenhurst [Nottingham Trent University] in real time, because we had accelerometers inside the hive and could stream and measure the vibrations. Later we had a session at a local recording studio, where I invited Tony Foster and Kevin Bales, Deirdre Bencsik, a classical cellist, and my daughter Camille, a singer, to try a few things out. We fed in a live stream from the beehive, a kind of deep visceral hum, and Deirdre quickly worked out that it was in the key of C. She played around that, Camille began to sing in response, and we had this incredible sound. We recorded around 150 little stems in the key of C during those sessions and used them in the pavilion by linking them with a variety of noise gates that would be triggered by the activity of the bees. This meant the sound you heard inside the pavilion was effectively being re-composed live by the bees themselves. 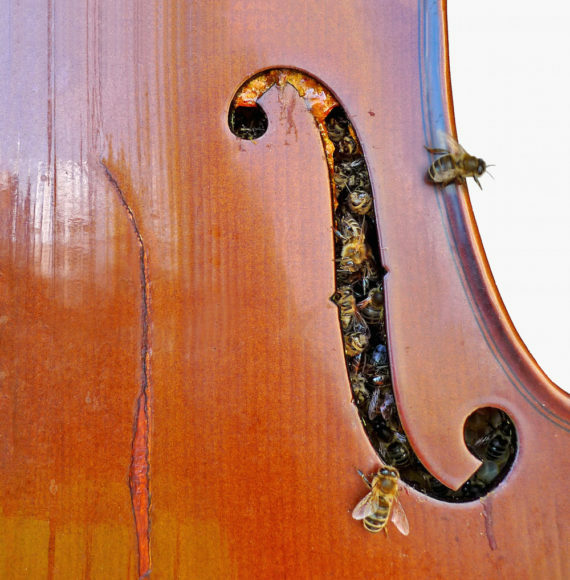 Whenever we perform BE: ONE live, the sound of the bees is with us in real time. The other element largely determined by activity in the beehive is the lighting. Yes, The Hive has LED lights built into it and each LED is programmed with a piece of software that is linked to the beehive in Kew Gardens. So in the mornings when the bees are quiet the lights just kind of shimmer gently, then later in the afternoon, when the bees become more active, the light patterns grow more intense and less predictable. In the daylight, when you’re inside the structure, it resembles a kind of dispersed cube, while at night, when the lights start to redefine the space, the outer edges get lost in the blackness and you should feel like you’re standing inside a sphere made of light. You’ve often worked with scientists, notably with your UNA piece in Canberra, made in collaboration with an astrophysicist, and your work on The Hive with Martin Bencsik. I think what makes these collaborations so interesting for me is the process of learning and coming to understand what scientists are doing. I think of those works as being the products of a symbiotic process because the scientists can learn new things from my perspective as an artist, and as an artist it goes without saying that I always learn a lot from scientists. It’s odd, because when I was younger science was definitely not something I ever thought was for me. Now I find the older I’ve got, the more I’ve realised there are parallels between the ways artists and scientists work. We’re essentially searching for meaning and questioning the world around us, looking for answers. It’s a search for similar things that drives us even if our methods appear to be very different on the surface. The new piece, BEAM, which you’re making for Wirksworth Festival in September, has been described as a companion piece to The Hive. BEAM is going to be installed inside St Mary’s Church in Wirksworth and that suggested ideas about community and communion which, for me, connected with the life of the beehive. In that sense, like The Hive, it’s about creating a space for contemplation. There are also some more direct links in the images and footage that will be projected. When I was approached about doing this project, and shown this beautiful old church, it seemed that trying to force a physical structure into the building would be the wrong approach, but using sound, light and projections could work well. 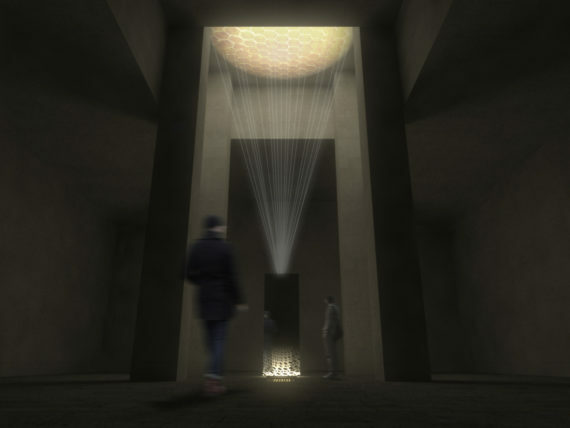 For that reason, BEAM will involve a projector obscured inside a mirror-covered totem. It should feel like a sunbeam rising from the ground to create an image inside the nave. It’ll be a quiet, gentle and reflective piece and hopefully engages very harmoniously with the fabric of the 13th century church, which I want to emphasise is well worth visiting in its own right. Has the interest in bees taken over a little, or is it just one strand in the work you’ve been making since The Hive first opened in Milan? Since the closing of the Expo, and with the process of moving The Hive to Kew, I’d say it’s easily taken up at least 50% of my time over the last year, quite apart from other projects related to bees, like the music and smaller pieces such as Bee Cello. I do have seven or eight other projects at various stages of development – in Taiwan, London, America and Japan – but it always takes a few years from planning to completion on projects like these. That’s also what’s particularly nice about doing BEAM in Wirksworth on a small scale. It can be taken from idea to realisation quickly, and when it’s installed the effect should be magical. It does seem that The Hive has raised your profile to a new level. I think that’s true, but my process is still the same and my studio is still a relatively small team of seven people. I suppose once in a while you happen to make something that hits a nerve and The Hive does seem to have clicked with people. It was even discussed on Gardener’s Question Time a few weeks ago, which is both amazing and bizarre. When I look back two years I can see that quite a lot has changed, but it’s also the case that during those years my time has been spent much as it’s always been, tapping away incrementally at whatever I’m doing in the studio.